Three-time Switzerland Olympic defenseman MARK STREIT skated in the Nationalliga A for the first time in eight years and registered an assist in the process but a debut appearance for SC BERN did not go all that well as visiting SC RAPPERSWIL-JONA snapped a tie early into the second period by scoring two goals inside of 22 seconds to win on the road 3-1 before a partisan crowd of 15,431 spectators at the PostFinance Arena in Bern. The 34-year-old blueliner, who had not played in the Swiss elite league since leaving SC Zuerich at the conclusion of the 2004/05 campaign to sign his first National Hockey League contract with the storied Montreal Canadiens, is one of a half dozen Switzerland national team players who have recently returned home as a result of the NHL labor dispute and subsequent “Lockout” situation in North America. Streit skated in all 82 regular season games (7 go, 47 pts, – 27 def rating) for the New York Islanders last season, his seventh on defense in the National Hockey League. SC Bern, who dramatically lost last season’s Nationallilga A playoff final in seven games to SC Zuerich, have also come to terms with ROMAN JOSI of the Nashville Predators but the young Switzerland national team defenseman had not arrived in country soon enough to be ready to play for SC Bern in Tuesday night’s Nationalliga A contest with visiting SC Rapperswil-Jona. The official SC Bern club website, however, announced Wednesday morning that the promising 22-year-old has, indeed, arrived in Bern and appeared at a short press conference. The club website also reported that Josi, who skated in 52 NHL regular season games (5 go, 16 pts, + 1 def rating) plus another ten Stanley Cup playoff contests (0 pts, – 4 def rating) for the Nashville Predators last term, is thought to be in good shape as a result of a conditioning program that he was participating in along with twenty other players. SC Bern’s smooth puck-handling defenseman MARK STREIT, a veteran of 443 NHL games (59 go, 261 pts) for the Montreal Canadiens and New York Islanders, has represented Switzerland at 15 major international tournaments (97 ga, 13 go, 35 as, 48 pts) and has also twice served as captain of the Swiss ice hockey squad at the Winter Olympic Games. … ROBBIE EARL, an NCAA champion with the University of Wisconsin who skated 47 NHL games for the Toronto Maple Leafs and Minnesota Wild before moving to Europe, STEFAN HUERLIMANN and Slovakia international JURAJ KOLNIK, the 31-year-old veteran of 250 NHL games for the New York Islanders and Florida Panthers, scored the goals for SC RAPPERSWIL-JONA in the Tuesday night’s NLA contest with SC Bern. The Lakers were, of course, thoroughly trounced 9-2 by HC Davos on their last outing in the Swiss elite league but rebounded well and are now tied with three teams in second place on nine points. Earl, the 27-year-old forward who transferred from Austrian side EHC Red Bull Salzburg this summer, now leads SC Rapperswil-Jona in scoring this early season with four points (two goals) from five NLA games. RYAN GARDNER, the veteran Canadian legionnaire who is beginning his 15th full season in the Swiss top flight, had the lone goal for SC Bern, his third of this new season in the Nationalliga A.
SC Bern were without influential but injured Canadian legionnaire BYRON RITCHIE, the 35-year-old who led the club with 43 points (22 goals) in the NLA regular season last term after transferring in from Swedish side Mo Do Ornskoldsvik. The well-traveled veteran of 333 NHL games has also been leading SC Bern in scoring this early season, as well. Ritchie paces last season’s Swiss runners-up with six points (three goals) in six European Trophy games and, heading into the match with SC Rapperswil-Jona, topped SC Bern with four points (three goals) in Nationalliga A.
SC Bern’s new defenseman MARK STREIT (4), who has appeared for Switzerland in a total of 184 internatioal matches altogether in his career, had a chance to score against SC Rapperswil-Jona’s two-time Switzerland Olympic goaltender DAVID AEBISCHER, the 34-year-old veteran of 214 NHL games who was a teammate of Streit’s with the Montreal Canadiens, but could not find the back of the net in the Nationalliga A contest at the world-renowned PostFinance Arena in Bern. SC Zurich goaltender LUKAS FLUEELER (30), the 23-year-old, one-time Ottawa 67s netminder who would later be named to the Switzerland senior national team for the 2012 IIHF World Championships in Scandinavia, fans out with the pads to deny SC Bern forward JOEL VERMIN (92), the 20-year-old youngster who has represented Switzerland at the last two IIHF World Junior Championships, a scoring chance at the side of the net during the National League A’s final playoff series match contested at the world-renowned PostFinance Arena in Bern. The final series of the National League A playoffs featured a pair of upstarts in SC BERN and SC ZURICH, neither of whom had ended the Swiss regular season even ranked among the top four teams in the standings. Nevertheless, this particular encounter still produced an epic battle that raged back and forth from the PostFinance Arena in Bern to the Hallenstadion in Zurich until the issue could be finally settled. The memorable, see-saw struggle would continue unabated, in fact, up until the very last seconds of the decisive seventh game. 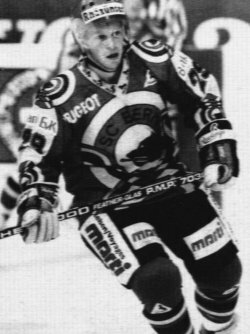 SC Bern winger J.P. DUMONT (17), the first round pick of the New York Islanders and third player taken overall at the 1996 National Hockey League Draft who went on to total 214 goals for the Chicago Black Hawks, Buffalo Sabres and Nashville Predators before arriving in the National League A to start this season, snapped a 1-1 tie with his second goal of the game late in the second period. The 34-year-old NHL veteran then assisted on SC Bern’s third for defenseman PHILIPPE FURRER, a former sixth round draft pick of the New York Rangers, seven minutes into the final frame before long-time Switzerland national team performer MARTIN PLUESS, a constituent of Furrer in Canada at the 2010 Winter Olympic Games, added a fourth with nine minutes remaining. SC Zurich pulled a power play goal back via ANDRES AMBUEHL, the one-time New York Rangers farmhand who spent the 2009/10 campaign with the Hartford Wolf Pack in the American Hockey League, three minutes from time … BYRON RITCHIE, the 35-year-old journeyman with more than 300 NHL games under his belt, registered three assists although, significantly, these would the last points that SC Bern’s PostFinance Topskorer would record in the 2012 NLA playoffs … RETO SCHAEPPI, who scored five goals for SC Zurich during the regular season, had tied the game for the visiting Lions with his fourth goal of the playoffs shortly past the midway mark of the second period. SC Zurich winger THIBAUT MONNET (above), the 2010 Vancouver Olympian who had already represented Switzerland at six major international tournaments prior to this season, scored a massive goal with five minutes remaining in the game to complete a third period rally and lift the Lions to level terms in the final playoff series. The visitors had drawn first blood two minutes into the second period via JOEL VERMIN, the Switzerland junior international who finished tied for third on SC Bern with 11 goals during NLA regular season. However, it was Canadian import BLAINE DOWN who reacted first to a lively rebound off the boards behind the net and equalized for SC Zurich seven minutes into the final period … The well-traveled Down, who spent three seasons with the Bridgeport Sound Tigers of the American Hockey League and also played in Denmark and Italy before signing with the farm club GC Kuesnacht Lions in the summer of 2008, certainly picked a prominent moment to strike for his one and only playoff goal this term; the 29-year-old forward had totaled six goals in 24 games for SC Zurich during the regular season … Making matters worse for SC Bern on the evening, the 2010 Swiss champions lost their two-goal hero from Game One, the highly-experienced and effective J.P. DUMONT, to injury in the defeat, as well; the 34-year-old had averaged one point per game in 31 regular season contests and, more importantly, compiled 14 points (6 go 8 as) in a dozen playoff games but, like SC Bern’s PostFinance Topskorer BYRON RITCHIE, would add no more points in the final series. SC Bern center ETIENNE FROIDEVAUX (20), the 23-year-old checker who notched six goals while playing in all 50 National League A regular season games this campaign, struck for a third time in the playoffs halfway through the contest and then set up a second for 21-year-old TRISTAN SCHERWEY nine minutes into the final frame as Finnish trainer ANTTI TORMANEN’s troops regained the advantage in the title series. Aging SC Bern assistant captain IVO RUETHEMANN, the 35-year-old, three-time Olympian who has represented Switzerland at 14 major international tournaments in his long career, added one last goal with but three minutes remaining. At the other end, veteran netminder MARCO BUEHRER blocked all 28 shots faced to frustrate visting SC Zurich … A first and last strike of the playoffs for the youthful Scherwey, who scored a combined five goals in all contests during SC Bern’s 2009/10 championship season but slipped to three goals in all this year … Replacing the injured J.P. Dumont in the SC Bern line-up was fellow Canadian legionnaire JEAN-PIERRE VIGIER (Northern Michigan University), the 35-year-old veteran of 213 National Hockey League games for the Atlanta Thrashers who had been a healthy scratch for the first two games of this NLA playoff final. Vigier’s coach his final season in Atlanta had been none other than the man currently standing behind the bench for SC Zurich, the imported Canadian trainer BOB HARTLEY. 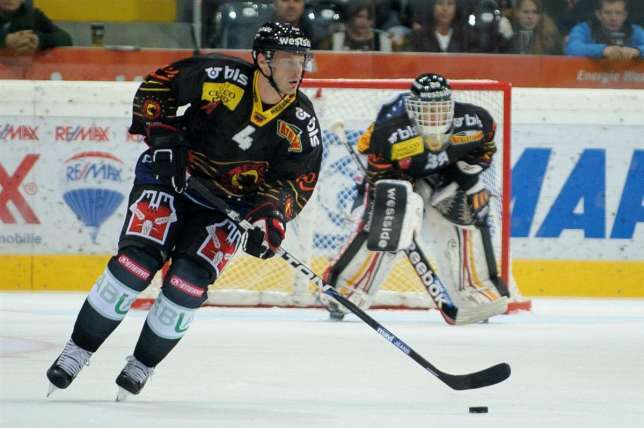 Also appearing in the series for the first time was former Phoenix Coyotes defender TRAVIS ROCHE (North Dakota University), the 33-year-old rearguard who had previously played a prominent role for SC Bern during its last title-winning campaign of 2009/10 … The match produced an uglier moment or two when SC Bern defender JOHANN MORANT, who would be suspended a considerable 14 games for his aggressive actions, repeatedly struck SC Zurich center CYRILL BUEHLER in the head and then manhanded a Swiss NLA official. Three minutes after failing on a penalty shot, SC Bern finally broke the scoreless deadlock when Switzerland veteran international IVO RUETHEMANN (32) netted a goal nine minutes into the second period and sent the visitors well on their way. 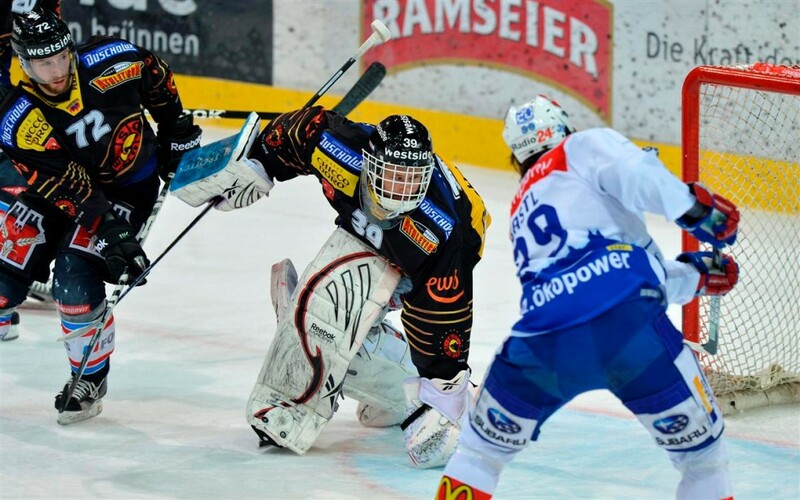 MARCO BUEHRER, the 32-year-old, reliable veteran who has backstopped SC Bern to two National League A titles since arriving from EHC Chur in the summer of 2002, turned aside all 25 shots and shutout SC Zurich for a second consecutive contest. Sparkplug SC Bern captain MARTIN PLEUSS, the 35-year-old, highly-experienced center who has also represented Switzerland at 14 major international tournaments and assisted on Ruethemann’s opening tally, tacked on an empty net goal in the final minute as the visitors stormed to a commanding 3-1 lead in the NLA final playoff series … SC Zurich defenseman PATRICK GEERING, the 22-year-old who played exactly one game for Switzerland at the 2010 IIHF World Championships, was unlucky to hit the crossbar with seven minutes to go in the opening period … ZSC Lions goaltender LUKAS FLUEELER, who put on a fine display at the Hallenstadion despite the defeat, halted SC Bern’s PostFinance Topskorer BYRON RITCHIE on the penalty shot six minutes into the second period … Veteran Switzerland international center THOMAS ZIELGER, the 33-year-old who skated nine seasons for SC Bern after returning from North America during the 2001/02 campaign, was scratched from the SC Zurich line-up by trainer BOB HARTLEY and would remain so for the rest of the series; Ziegler appeared in five National Hockey League games for the Tampa Bay Lightning during the 2000/01 campaign but bolted the Springfield Falcons of the American Hockey League after skating in just three games to start the next season. Highly-experienced, three-time Switzerland Olympic defenseman and club captain MATHIAS SEGER (15) scored a life-saving goal ten minutes into the overtime session as SC Zurich avoided elimination in dramatic fashion at the “unique cauldron” that is the PostFinance Arena. Relatively-untested ZSC Lions goaltender LUKAS FLUEELER was the real star of the show who made it all possible by saving 33 shots from an SC Bern squad determined to end the series immediately. With their backs up against the proverbial wall, the visitors had broken through first after 37-year-old dinosaur DOMENIC PITTIS, the former 2nd round pick of the Pittsburgh Penquins at the 1993 National Hockey League Draft who later managed 86 NHL games in ten years of North American professional hockey, converted a pass from Switzerland Olympic center ANDRES AMBUEHL almost halfway through the contest but SC Bern, who outshot SC Zurich by a 17-9 margin over the first two periods, equalized four minutes later with a goal from checker ETIENNE FROIDEVAUX, his second of this final playoff series … Having skated in 94 games (3 go 18 as) while representing Switzerland at 15 major international tournaments since 1998 heading into this season, the SC Zurich skipper Seger is the most-experienced international player on either side of this final playoff series … Sitting out for a second consecutive contest was suspended SC Bern defenseman JOHANN MORANT, the 26-year-old who appeared twice for France at the Division I (old B Pool) of the IIHF World Junior Championships previously in 2005 and 2006 but plays in the National League A with a Swiss passport and, thus, does not count against the strict quota on foreigners … SC Bern defenseman JOEL KWIATKOWSKI, who logged 282 NHL games for five clubs in ten years of North American professional hockey, was a healthy scratch for the second time in three games; the 35-year-old who represented Canada at the 2009 IIHF World Championships originally signed with SC Bern in the summer of 2010 after two seasons in the Kontinental Hockey League with Russian clubs Severstal Cherepovets and SKA St. Petersburg, respectively. 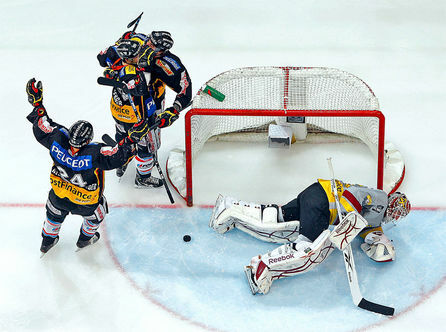 With the opportunity to tie the series at hand, SC Zurich unleash a Schuetzefest and score six goals, the exact same number Canadian trainer BOB HARTLEY’s charges had totaled against SC Bern’s veteran goaltender MARCO BUEHRER (39) through the first five games of the playoff final, on home ice at the Hallenstadion. After a scoreless first period, the ZSC Lions opened up a 3-0 lead on goals by Switzerland Olympic forwards THIBAUT MONNET (7) and ANDRES AMBUEHL, as well as influential club captain MATHIAS SEGER, all in a 10-minute span midway through the second. Two Blitztore from Canadian-born Switzerland international RYAN GARDNER, the 34-year-old veteran who once played three seasons of junior with London and North Bay in the Ontario Hockey League, brought SC Bern back quickly but eternal 37-year-old National Hockey League veteran DOMENIC PITTIS, enabled by Ambuehl and Monnet, struck on the power play for SC Zurich with only a minute left in the second session … SC Bern captain MARTIN PLUESS, who previously spent four seasons in the Swedish elite league with HC Vastra Frolunda Gothenburg before returning home in 2008 and has also registered 25 goals in 88 games at major international tournaments for Switzerland in his career entering this season, responded with a power play goal and pulled the visitors to within one just two minutes into the final period. But 27-year-old Switzerland international winger PATRICK BAERTSCHI, the one-time Pittsburgh Penquins’ 7th round draft pick who spent three seasons with SC Bern before joining the ZSC Lions in the summer of 2010, aborted any comeback by scoring a big goal against his old club and just four minutes later. SC Zurich’s PostFinance Topskorer JEFF TAMBELLINI (Michigan Univ), the former 1st round pick of the Los Angeles Kings at the 2003 NHL Draft who skated in six playoff games for the Vancouver Canucks during their run to the Stanley Cup Final last season, sealed the deal by finding the empty net about a minute to go … The late goal and an assist on Ambuehl’s strike earlier in the contest amounted to the first two points of the final playoff series for the Canadian legionnaire Tambellini, the 28-year-old left wing who led the ZSC Lions with both 23 goals and 45 points during the “Qualifikation” campaign … SC Zurich defenseman STEVE MCCARTHY, the former 1st round pick of the Chicago Black Hawks at the 1999 NHL Draft who was brought in to bolster the blueline a quarter of the way through the season by ZSC Lions trainer BOB HARTLEY, sent some kind of message by blasting a puck off the post only 50 seconds into the contest … Baertschi’s goal chased veteran SC Bern goaltender MARCO BUEHRER, who traveled with the Swiss national team to seven major international tournaments from 2001 thru 2006 but only appeared in six matches collectively, to the bench six minutes into the deciding period. 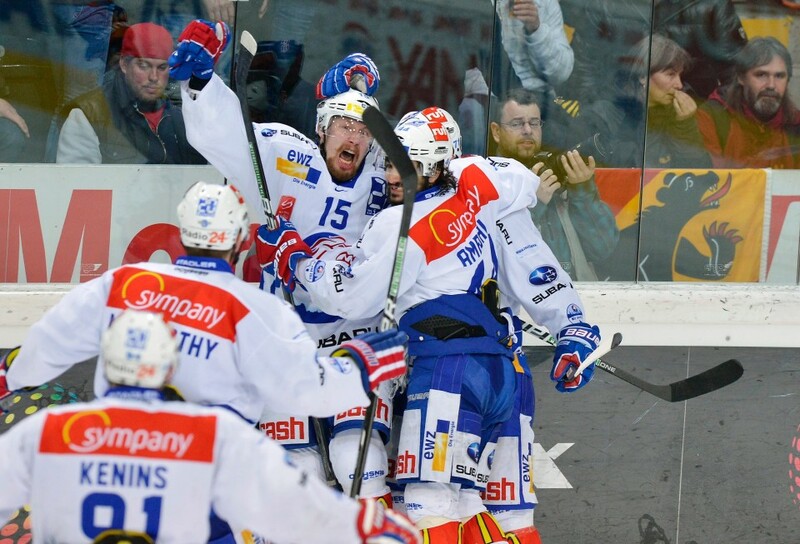 A sensational goal with exactly 2.5 seconds left in the third period not only powered resilient SC Zurich to victory in the seventh and final game of the National League A final playoff series, the score also completed a spectacular comeback which saw the ZSC Lions fight back after initially falling behind admirable SC Bern three games to one. Despite being outshot by an 8-5 margin, SC Zurich managed to take the lead on the road at the PostFinance Arena in the very last minute of the opening period with a goal by MARK BASTL, the 31-year-old Swiss veteran who once played three seasons of college hockey in the United States for Findlay University in Ohio. SC Bern retaliated, however, only two minutes into the following frame when SC Bern veteran Switzerland international IVO RUETHEMANN scored his third goal of the series … The home side went on to outshoot their guests by the lopsided 16-3 margin in the second period but the ZSC Lions persevered with trainer BOB HARTLEY’s conservative tactics and profited from solid goaltending by 23-year-old LUKAS FLUEELER. SC Bern would come to regret not having capitalized on so many opportunities as SC Zurich came out of its shell to generate ten shots on goal in the final period and ultimately scored to win when imported Canadian defenseman STEVE MCCARTHY, the 31-year-old veteran of 302 National Hockey League games initially signed to a three-week contract with no guarantees by the ZSC Lions last October, picked up a loose puck in the slot between the faceoff circles … McCarthy’s Meistertreffer (championship goal) was not only the first of this 2011/12 playoff campaign for the one-time first round NHL Draft pick, the tally was also the very first goal that the 12-year professional had ever scored in the postseason in any league … Filling in for injured Canadian import BLAINE DOWN and making his first appearance of the final playoff series for SC Zurich was Slovakia international winger JURAJ KOLNIK, the 31-year-old veteran of 250 NHL games who topped HC Servette Geneva in scoring two consecutive years after leaving the Florida Panthers at the end of the 2006/07 season; a two-time performer at the annual IIHF World Championships, Kolnik had reached the National League A final playoff series with HC Servette Geneva in 2010 only to lose the title to SC Bern. Triumphant SC Zurich captain MATHIAS SEGER (15), who scored just two goals in 14 postseason contests but saved them both for the final playoff series against vanquished SC Bern, lifts the National League A title trophy high at the conclusion of the heart-stopping Game Seven contested at the sold-out PostFinance Arena in Bern, Switzerland. 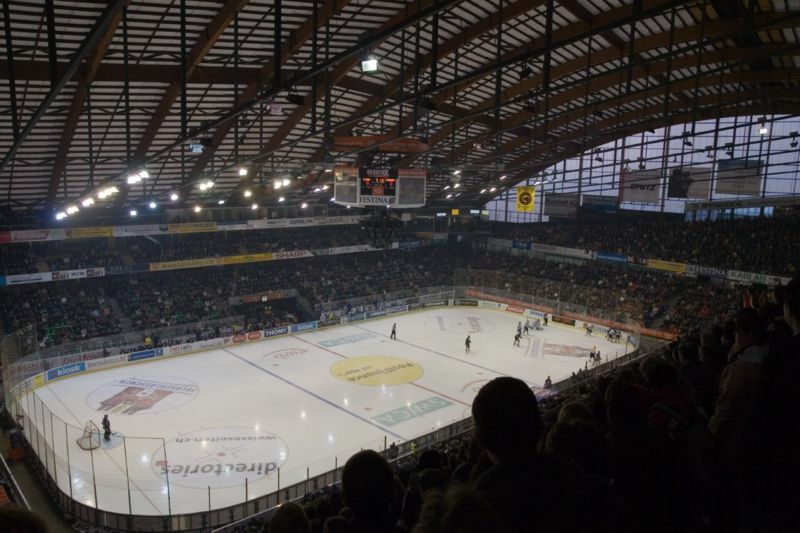 For no less than a 10th consecutive season, the well-supported Swiss Nationalliga A outfit SCHLITTSCHUH CLUB BERN led all European professional ice hockey teams at the box office in terms of average attendance per contest. This in a year which saw a record seven teams in five different countries surpass the noteworthy milestone of at least 10,000 spectators on average. The German Bundesliga club Koelner Haie (Cologne Sharks) were the last team other than the 12-times national champion of Switzerland to lead the entire continent at the gate but, indeed, only just beat out SC Bern by a mere 64 spectators to claim the honor at the end of the 2001-02 campaign. 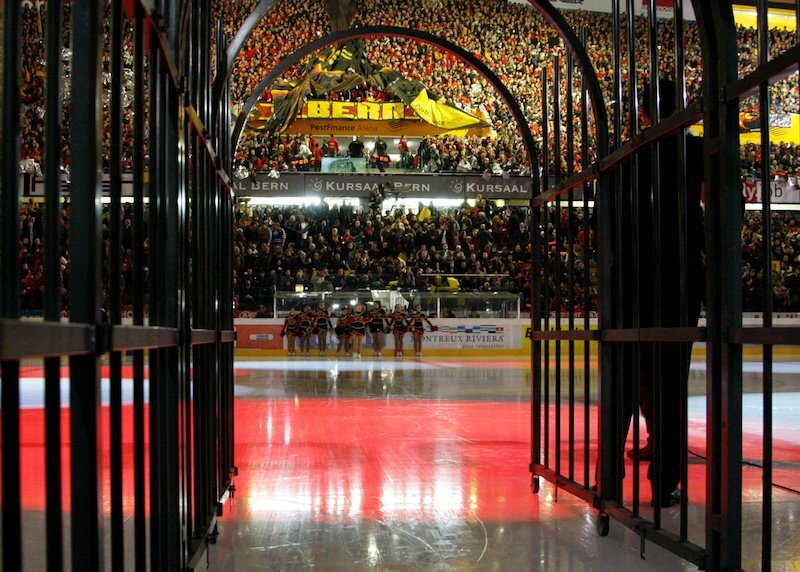 With the National Hockey League regular season having just ended, it is now known that SC Bern also beat eight National Hockey League clubs in average attendance. That figure represents more than 1/4 of all NHL teams for this 2011/12 campaign. Although the average for the Swiss side dropped slightly to 15,779 per game this season, this total was also two and a half times more than the average gate for a Nationalliga A game in Switzerland this term. The National Hockey League, which was first established in 1917, has always advertised its product as the finest in all the world. Certainly, the multi-million dollar salaries paid to players in the NHL provides signifcant weight to that promotional claim. And yet for this 2011/12 season, the traditionally-popular Swiss club SC BERN, who were officially founded on the first day of 1931, still managed to outdraw the Colorado Avalanche, New Jersey Devils, Winnipeg Jets, Anaheim Ducks, Columbus Blue Jackets, Dallas Stars, New York Islanders and Phoenix Coyotes. 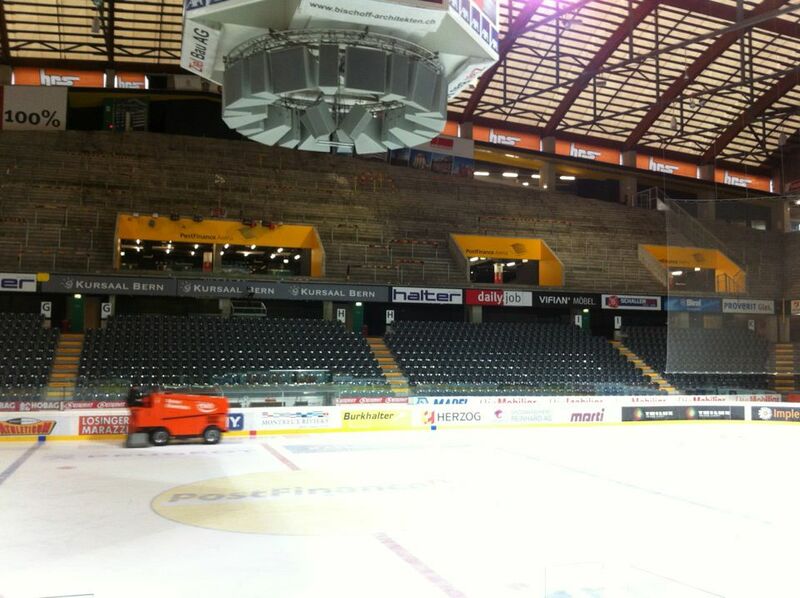 Situated on the predominantly-hilly, so-called Swiss Plateau in the national capital city is the home rink to the incredibly popular professional ice hockey club, SCHLITTSCHUH CLUB BERN, that has now boasted the best per-game attendance compared to all others throughout the whole of Europe for the past 10 consecutive years in a row — the POST FINANCE ARENA. 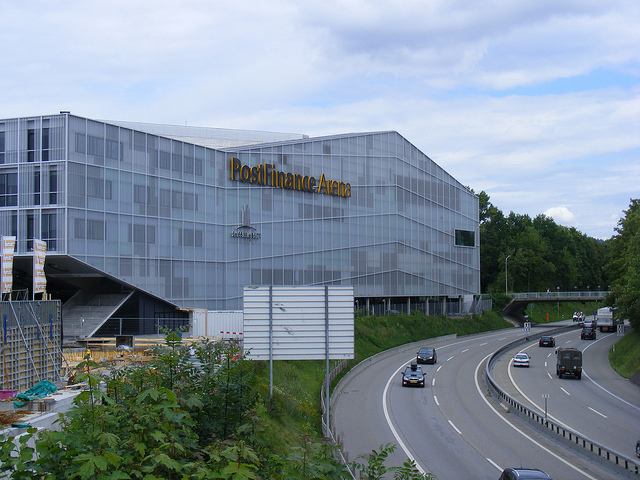 The Post Finance Arena is the largest rink in Switzerland as well as one of the largest facilities used for ice hockey in all of Europe. The rink was originally opened in 1967 as the Eisstadion Allmend and later assumed its current name as part of a sponsorship deal prior to the start of the 2007/08 season. 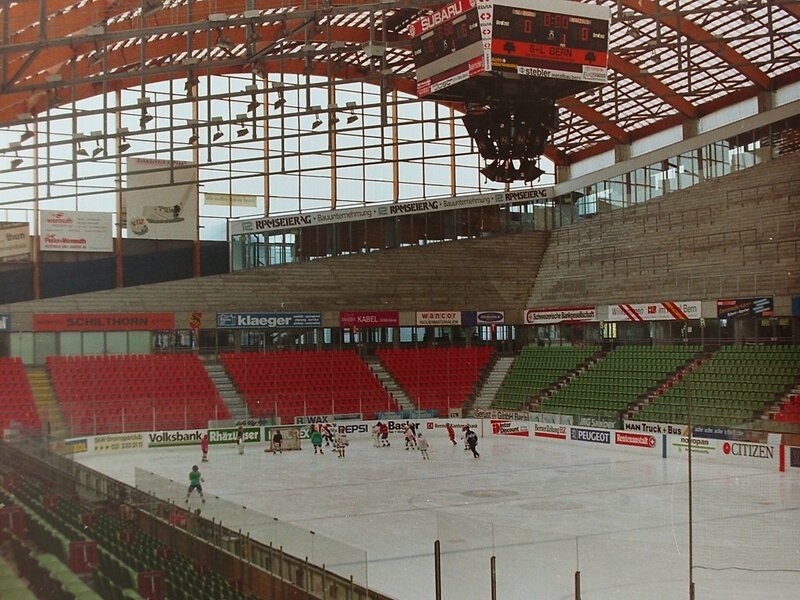 In light of the arena’s age and with the 2009 IIHF World Championships scheduled to take place in die Schweiz, the stadium owners in Bern invested 105 million Swiss francs (CHF – roughly $ 114 million U.S. dollars today) for extension and restoration of the building. The work was completed prior to the start of the 2008/09 campaign with the majority of the construction focused on renovation and expansion of the so-called VIP Zone, which now includes 21 luxury boxes. 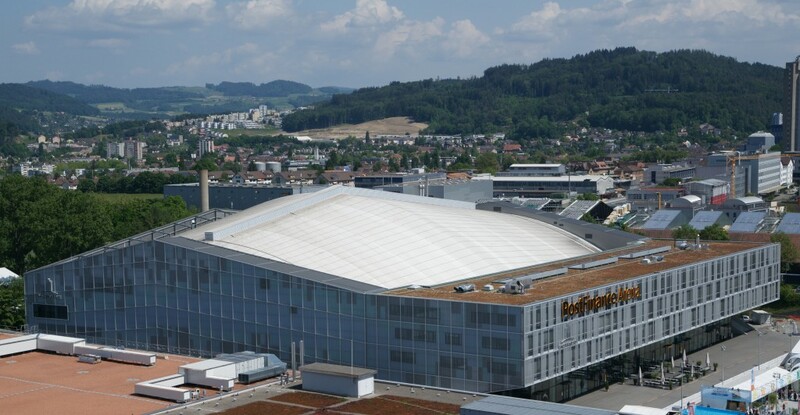 The official capacity for the POST FINANCE ARENA in Bern would be 17,131 at present. Oddly enough, the Swiss stadium actually still has only 6,709 fixed seats. 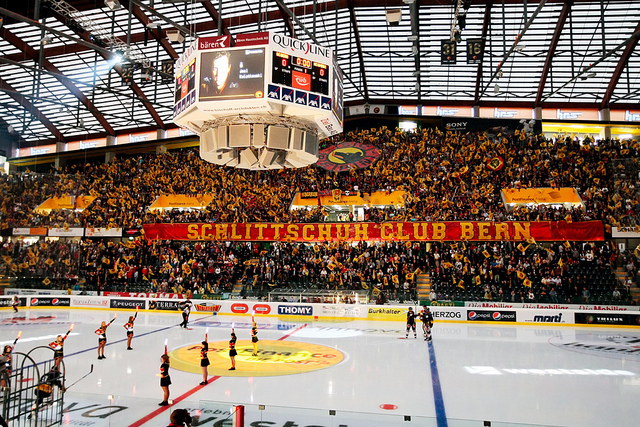 But the facility does host a world-famous standing-room-only section that is traditionally well-stocked with passionate SC Bern supporters for each and every Nationalliga A game. One notable feature of the eye-opening second level (standing-room-only section) is the very steep incline; the above photo provides a good look at the railings in the s.r.o. section and captures youth players at practice. A bird’s eye view from way up in the so-called “rafters” of the world-famous, second level standing-room-only section of the Post Finance Arena in Bern. 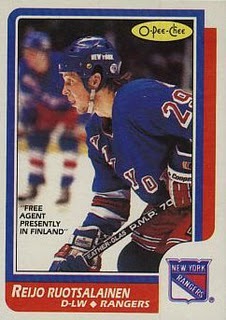 Finnish Olympic silver medalist REIJO RUOTSALAINEN (above), the diminutive, smooth-skating rearguard who represented the New York Rangers at the 1986 NHL All-Star Game and earned two Stanley Cup rings with the powerful Edmonton Oilers in 1987 and 1990, also contributed to another three Nationalliga A titles with Schlittschuh Club Bern in six seasons spread out over four different tours of duty for the capital city side in Switzerland. RYAN CALLAHAN (24) of the New York Rangers, who went on to collect a silver medal with the United States at the 2010 Winter Olympic Games in Vancouver, Canada, goes to the forehand and beats Metallurg Magnitogorsk goaltender ANDREI MEZIN, the three-time Belarus Olympic netminder who backstopped his country to a famous upset of Sweden in the quarterfinal round at the 2002 Winter Games at Salt Lake City, with 20 seconds remaining to allow the National Hockey League representative to down their Russian counterparts in the VICTORIA CUP match staged in early October of 2008 at the Post Finance Arena in Bern, Switzerland. 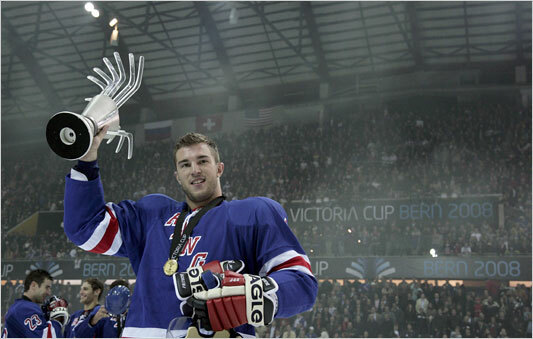 DAN FRITSCHE of the New York Rangers, who scored one of the goals that allowed the Original Six NHL side to rally from a deficit of three and defeat Russian Super League club Metallurg Magnitogorsk, holds the Victoria Cup trophy aloft in front of the official crowd of 13,749 at the Post Finance Arena in early October of 2008. The native of Ohio, who had been acquired by the Blueshirts after skating in 187 NHL games for the Columbus Blue Jackets the previous three years, only played 16 regular season games and scored just one goal with the Rangers before being traded to the Minnesota Wild in late January of 2009. Fritsche has spent the last two seasons lacing his skates in Switzerland again, this time with HC Servette Geneva. 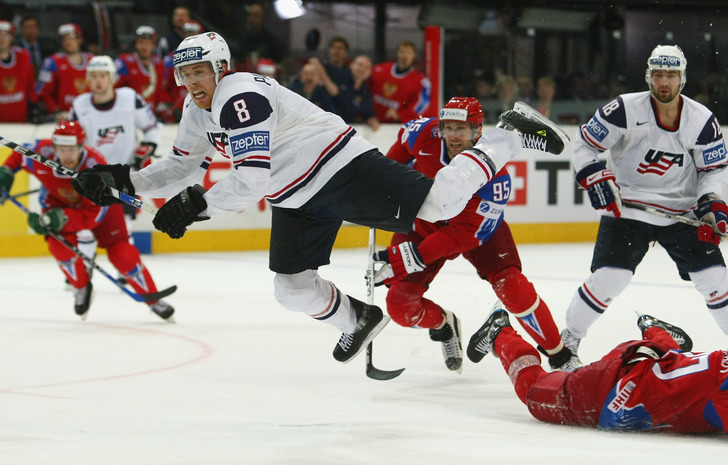 Russia captain ALEXEI MOROZOV (95) of Ak Bars Kazan, who was once chosen in the first round of the 1995 National Hockey League Draft and later skated 451 NHL games over six seasons for the Pittsburgh Penquins, observes as United States forward JOE PAVELSKI (8) of the San Jose Sharks goes flying during the 2009 IIHF World Championships semi-final contest at the Post Finance Arena in Bern, Switzerland; a third period goal by SKA St. Petersburg center Konstantin Gorovikov with less than two minutes remaining propelled eventual gold-medalist Russia to a 3-2 victory over the United States, who ended the tournament in fourth place. The Zamboni and its driver begin to take laps at the Post Finance Arena in the capital city of Switzerland to prepare for the third game of the best-of-seven Nationalliga A Playoff Final between host SC Bern and visiting SC Zuerich this past Saturday just ahead of the Easter Holiday. For all the Swiss internationals and veteran NHL players on the team roster, in the end it was the so-called Youngster Line that directed the club to the domestic championship of Switzerland. SC BERN defeated of HC SERVETTE GENEVA 4-1 in Game Seven of the Nationalliga A final series to capture its first league title in six years and its 12th elite league championship of Switzerland since the club played its first official game on January 1, 1931. SC Bern actually bagged its first Swiss elite league title in 1959. The championship caps off a successful first season with the capital club for head coach LARRY HURAS, the one-time New York Rangers rearguard who bolted Austrian club SV Villach and inked a two-year deal with SC Bern in late April of last year. HC Servette Geneva and head coach CHRIS MCSORLEY, who battled back after falling behind three games to one in the series, arrived in Bern with their own intentions it must be said. 25-year-old forward FLORIAN CONZ sent Servette to the lead with a Blitztor just 1:20 into the match. For Conz, it was his second of the Nationalliga A finals; the former Swiss U-20 international had four goals in 50 regular season games for Geneva. Bern soon rebounded from the shock of the lightning strike led by the Youngster Line — PASCAL BERGER, ETIENNE FROIDEVAUX, and CARYL NEUENSCHWANDER. The 21-year-old center Froidevaux, a three-time participant at the IIHF World Junior Championships for Switzerland, found the net to even the match nine minutes in. Froidevaux, who scored four goals in 36 regular season games and increased his rate to three goals in 15 playoff contests (including two in the finals), then assisted on what would prove to be the championship-winning goal within the next three minutes. 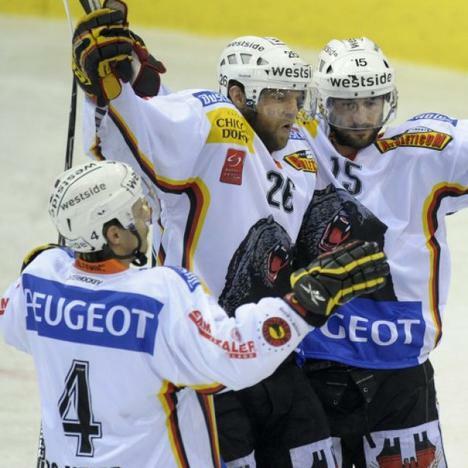 With not even two minutes of the second period played, veteran NHL forward JEAN-PIERRE VIGIER (Northern Michigan Univ) valuted SC Bern to 3-1 with his fourth goal of the Swiss final series. Brought in from Servette Geneva to start this season, the 33-year-old Canadian legionnaire finished the playoffs as Bern’s second leading scorer with seven goals and 14 points. The 21-year-old Berger switched off the lights for Servette with his fourth playoff goal in the third minute of the final period. 33-year-old Swiss Olympian MARTIN PLUESS put a puck off the post in the 59th minute but by that point it mattered little to the SC Bern veteran. The triumph of SC Bern in the 2010 Nationalliga A playoffs completes a distinct hat trick for the club’s Canadian coach, LARRY HURAS. An abrasive defenseman as a player who once skated two games for the New York Rangers in the National Hockey League during the tumultuos 1970s, Huras has now posted three titles with three different clubs in the first decade of the new millenium as a head coach in Switzerland — 2001 : SC Zuerich, 2003 : HC Lugano and 2010 : SC Bern. Huras also won four titles as a Trainer in France with HC Rouen; three of those championships were technically earned as player-coach although the last two seasons the native of Listowel, Ontario, spent very little time on ice. DANIEL RUBIN scored an unassisted goal five minutes from time to give HC SERVETTE GENEVA a 2-1 victory over SC BERN in Game Six of the Swiss Nationalliga A championship final in front of a sellout crowd of 7,202 at the Patinoire des Vernets in Geneva. Swiss Olympian IVO RUETHEMANN snapped a scoreless tie five minutes into the second period with his seventh goal of the playoffs to put SC Bern on the scoreboard first. However, Swiss international defenseman GORAN BEZINA, the game-winning-goal scorer of Game Five for Servette, struck again a scant three minutes later to re-establish the stalemate. Rubin’s second goal of this championship series gave the final result to Geneva. The Nationalliga A title for the 2010 season in Switzerland now boils down to a solitary Game Seven. 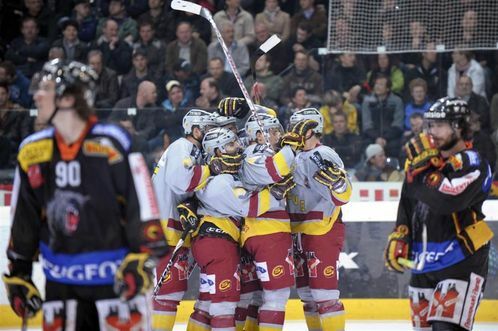 Swiss international defenseman GORAN BEZINA scored in the fourth minute of extra time as SERVETTE GENEVA turned the tables on SC BERN with a 3-2 victory in Game Five of the Nationalliga A championship series at the PostFinance Arena in the Swiss capital. With the win, head coach CHRIS MCSORLEY’s Servette squad stay alive still down three games to two and now earn another skate against Bern at the Patinoire des Vernets in Geneva. 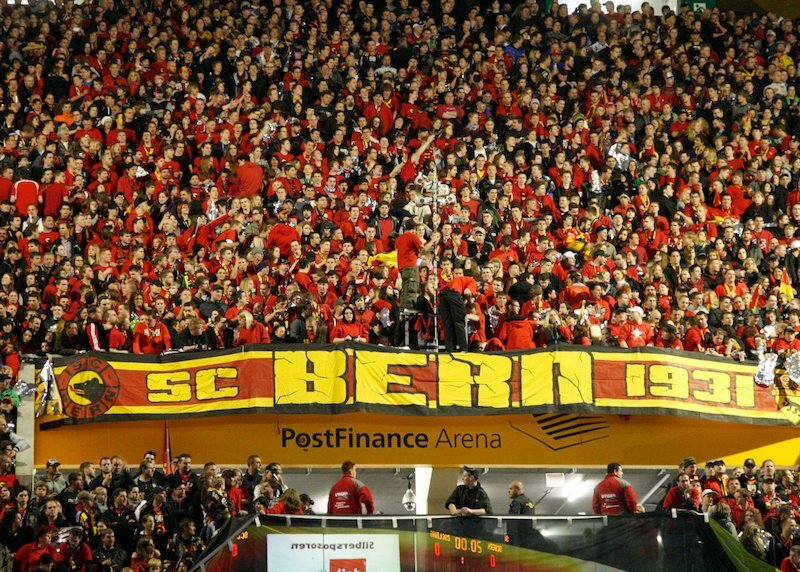 A largely expectant crowd of 17,131 packed the PostFinance Arena for yet another sellout with the possibility of home side SC Bern procuring their first Swiss title since 2004 at hand. Servette Geneva forward THOMAS DERUNS gave the home Volk reason to feel disappointed with a power play goal in the fifth minute of the match. The Swiss Olympian continued his fine form with his fifth goal for Servette the past four games of the 2010 Nationalliga A championship series and pushed his playoff-leading totals to ten goals and 25 points. 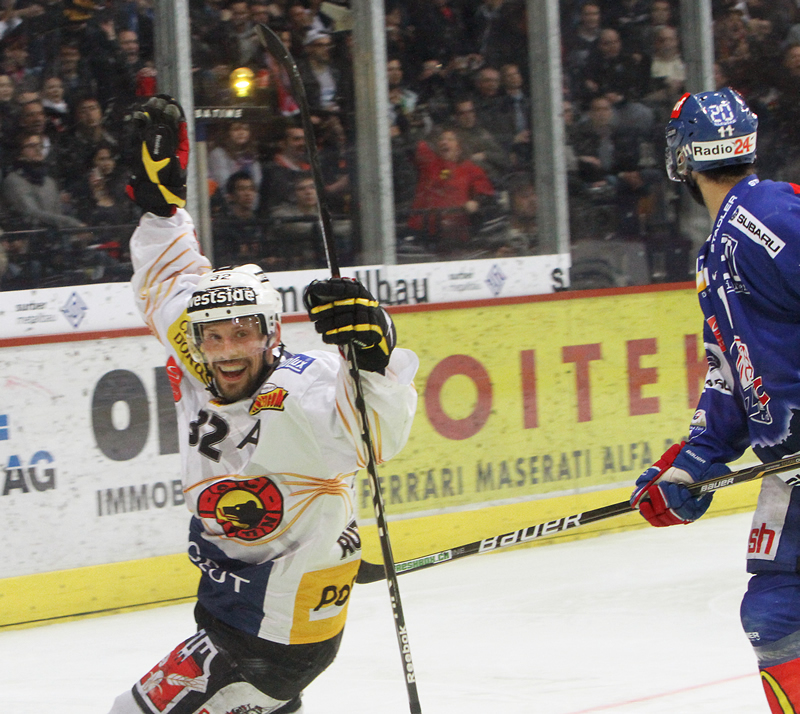 Aging veteran TREVOR MEIER evened matters for SC Bern early in the second period. The 36-year-old native of Oakville in Ontario, Canada, on his second tour of duty with the Swiss capital club, scored an even-strength goal with assists from Swiss international defenseman BEAT GERBER and 21-year-old PASCAL BERGER in the fifth minute of the middle frame. Just past the halfwalf point of the final period, RETO SURI scored his second goal of this year’s Swiss finals to give Servette Geneva a brief lead which disappeared after German international defenseman ROBIN BREITBACH was banished to the penalty box. Canadian legionnaire TRAVIS ROCHE, the former Phoenix Coyote, equalized for SC Bern on the ensuing power play with seven minutes remaining in regulation play. Thus, for the third time in five games for this final series between SC Bern and HC Servette Geneva, overtime was required to render a decision. And so it was left for Bezina, who skated three games in the National Hockey League for the Phoenix Coyotes during the 2003-04 campaign, to be a hero for Servette. Another tying-goal in the latter half of the third period and another lightning strike from Swiss Olympic forward IVO RUETHEMANN again combine to bring SC BERN a dramatic 4-3 victory over HC Servette Geneva in Game Four of the Nationalliga A finals from the Patinoire des Vernets in Geneva. Swiss Olympian MARTIN PLUESS of SC Bern and Slovakian international JURAJ KOLNIK of HC Servette Geneva traded first period goals while Canadian legionnaire SIMON GAMACHE, with his sixth goal in seven playoff games for SC Bern this spring, and Swiss Olympic forward THOMAS DERUNS of Servette repeated the same pattern in the second period. Deruns delievered a most memorable moment for the history of Swiss hockey with a spectacular goal in the third minute of the final period. The 28-year-old veteran Swiss international cradled the puck onto the blade of his stick behind the opponents’ goal and then lifted it into the air to stuff such lacrosse-style past an unsuspecting MARCO BUEHRER into the SC Bern net. Deruns currently leads all Nationalliga A playoff scorers with nine goals and 24 points. The Nationalliga A regular season champions rallied once more in the third period, however, and regained equilibrium with a goal from veteran National Hockey Leaguer BRETT MCLEAN in the 50th minute of the match. As was the case in the series opener, Ruethemann brought matters to an abrupt conclusion with an overtime Blitztor on behalf of SC Bern. In this instance, only 53 seconds of play was needed to settle the matter, which is seventeen less than what was required for Game One. Ruethemann remains SC Bern’s playoff scoring leader with six goals and 14 points from 12 games. SC Bern and head coach LARRY HURAS now have just one hurdle to clear in order to claim the club’s first championship since 2004. Outstanding. The nerve. Not to mention the skill.